Why is our popcorn so good? From starting the batch to filling the cone, each batch of our gourmet popcorn is masterfully created using only the freshest, all natural ingredients.The Journey begins in the heartland of America, where we source the highest quality popping corn, from farms that for over 75 years have been known for producing bountiful harvests of beautiful, golden corn.We put our corn on a pretty high pedestal, so it is only fitting that we pair it with only the best ingredients, such as the fresh, sweet butter we have delivered fresh daily by a certified dairy. Coupled with a host of other wholesome, chemical free ingredients, we are able to guarantee that our popcorn is the hallmark of quality from the first bite, to the bottom of the tin.The final secret in this recipe for popcorn is that we have a true passion for our product. We take great pride in all of our tasty treats, because the greatest reward is to see a content smile on your face right after you take your first bite! We make the best gourmet popcorn, but don’t take our word for it, place an order, or if you can’t wait, pop on over to one of our retail locations, and share in the Popcornopolis experience!At Popcornopolis, we value integrity more than anything and we fully guarantee that you will be delighted with any purchase you ever make and any gift you ever send or we will make it right, whatever it takes. Period. We love to watch movies on the weekends as a family; so popcorn is a "staple" treat in our home. We always keep popcorn in the house for our family movie nights. Having heard about Popcornopolis before on The Food Network, I was familiar with the companies wide array of specialty popcorn's and was excited to try them out with my family! Popcornopolis shared five flavors with us for review; Carmel, Carmel Almond, Cheese, Zebra, & Cinnamon Bun. Each and every flavor was a hit in our home! The Zebra flavor was particularly AWESOME and well received; with Carmel, milk chocolate, and white chocolate...oh my! YUM! YUM! YUM! You really have to taste to understand ;) . Purchase assorted flavors packaged in Jumbo Cones and by simply tying a ribbon around the top they would be gift ready! The perfect treat for Holiday Gift Giving! For that extra special gift this Holiday Season they also have assorted tins and gift baskets. 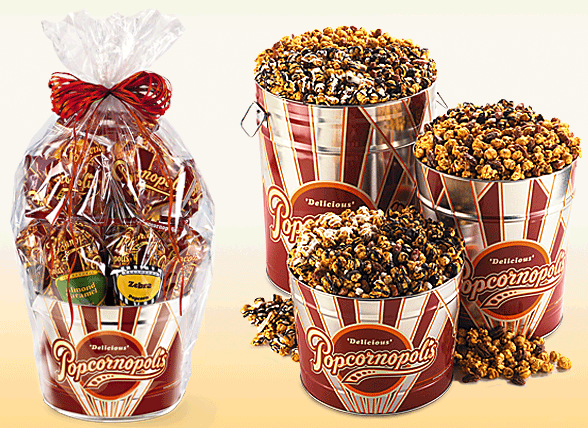 Popcornopolis Popcorn is a delicious treat that's sure to impress!